This self-contained unit is ideal for the study of current and power consumption of domestic appliances used in everyday life. It visually displays the effect of using energy-efficient appliances to an increasingly energy-conscious audience. The measurement of current taken by domestic appliances is potentially dangerous when dealing with main voltage. 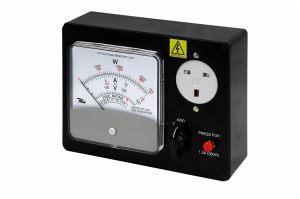 The APC682 meter however, enables the current taken by an electrical appliance drawing up to 13A AC to be measured in a cost-effective and safe manner without disturbing the mains lead. The appliance is simply plugged into the socket on the unit and the unit plugged into the mains supply. The unit consists of a moving coil rectifier type instrument fitted into a moulded A.B.S. box. This also houses a standard 13A socket, together with a selector switch and two metres of connecting cable terminating in a 13A rubber-cased safety plug.